ERP software consists of multiple enterprise software modules that are individually purchased based on specific needs and technical capabilities. 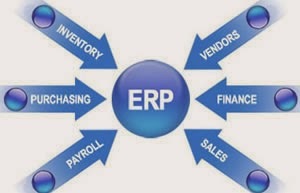 A business can use ERP software to manage back office activities and tasks such as distribution process management, supply chain management, knowledge based services, accuracy of financial data, project planning, critical business procedures, accounting and financial applications, lower purchasing costs, human resources, payroll and others. With the growing popularity of ERP methodology, software applications to help business managers implement ERP into other business activities have emerged. Depending on the size of an organization and its requirements there are a number of enterprise resource planning software vendors available in the large enterprise, mid market and small business segment. · Facilitates informed decision making. · Cost saving solutions through organized business processes. · Integrates business processes facilitating better control. · Improves the work flow and information flow in the organization. · Introduces transparency in activities. · Improves speed and efficiency in functions leading to improved customer service and customer satisfaction. · Facilitates co-ordination of activities between different departments. · Provides quality communication channels Leverage. · IT Infrastructure and information assets. · Gives a competitive edge. Greatful informations on ERP solution. To implement erp project organization must perform an honest assessment of various business needs.ERP project plan is built using a project management package that permits one to focus on planned activities from various perspectives. Manufacturing Resource Planning is the original modality of what we know now as ERP, and covered materials planning.MRP II erp module helps to maintain a neat agenda for the manner in which the resources are to be allocated without any confusion. I am fairly much satisfied with your excellent perform and you put really very information, Looking to studying your next post.